Decaf IOC-M Control Module – PiXCL Automation Technologies Inc. Does your project require a USB control module to handle multiple digital inputs (switches and device binary states), digital outputs (binary controls and status LEDs) and analog inputs? The IOC-M is ideal for this, as it is a USB Human Interface Device that works with the standard Window driver. This means that all your controls and sensors are handled at the app level. The IOC-M module is 54x23mm and is intended to be soldered on to or plugged into another circuit board that implements the sensors, controls and relevent connectors. the 72 MHz Cortex-M3 controller board with firmware already installed, plus USB cable. PiXCL 19 for app creation (Windows 10 / 8 / 7), via download. 8 digital outputs (active H) i.e. equivalent to turning a switch ON. 2 digital control outputs (active L) i.e. for devices with CS (ChipSelect) L requirements. 8 digital inputs (active H) i.e. when a switch or equivalent is ON. 2 analog inputs (0-3v3) for your sensors. SPI devices with NSS and external CS pins. This allows multiple SPI devices to part of your project. Real Time Clock (RTC) e.g. for time stamping data events. An external VBAT (3v3 such as a button battery) can be supplied to keep the RTC running if needed. These controls are usually enough to get a simple sensor set running. 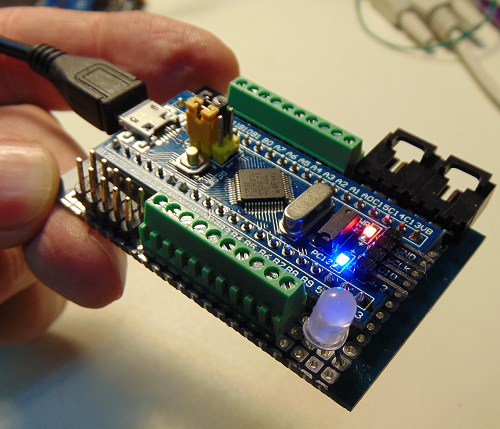 Sensors can be powered by 5V or 3V3, while the microcontroller runs on 3V3, derived on-board from the USB 5V supply. Here’s an example of what you can do. 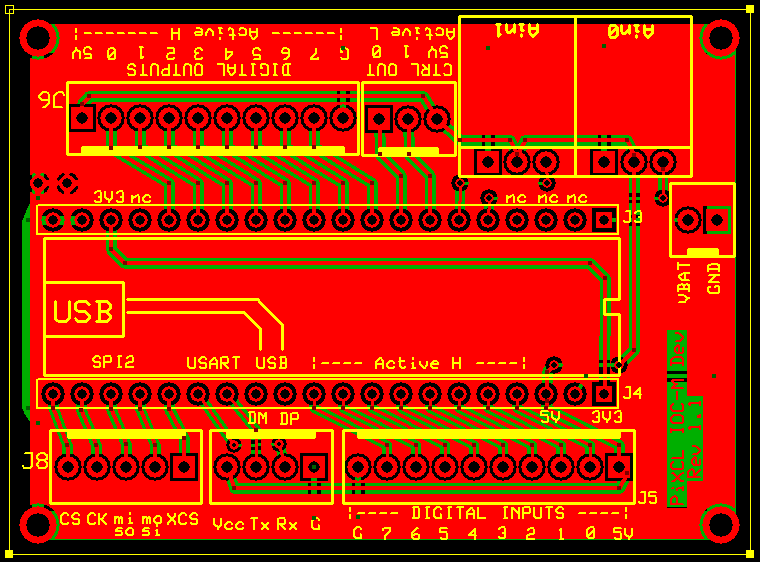 User pcb mockup with the IOC-M, digital I/O connectors, analog inputs and an RGB LED. SPI and USART connection are on the double row header. How about a real development board for the IOC-M? We have created an optional circuit board with the standard Decaf digital I/O and analog input connectors to get your project started. The IOC-M plugs into the two 20 pin headers. Contact us today with your requirements, and we’ll see what we can do. Our rates are affordable.